As Prue Richards retires as the Oberlin Heritage Center’s extraordinary Collections expert, the organization hopes to be able to conserve and stabilize a wonderfully unique and amazingly worn early 19th century quilt in the collection that has always been a favorite of Prue’s (and until this opportunity, it has been too brittle to display). This delightful quilt was given to the Allen Memorial Art Museum by Frederick B. Artz (1894-1983), a graduate of Oberlin College (1916) and a popular and distinguished faculty member in the College’s Department of History from 1924-1961. The quilt originally belonged to Professor Raymond H. Stetson (1872-1950), also an Oberlin College alumnus (1893) and a faculty member in the Department of Psychology (1909-1939), who shared the Artz residence with Freddie for 27 years, and the quilt remained with Artz following Stetson’s death. Stetson studied with Frank Fanning Jewett and worked as Jewett’s graduate assistant while pursuing a master’s degree in zoology from the College. Stetson also was strongly influenced by the work of William Benton Chamberlain who taught speech and rhetoric at the College – and two of whose significant family quilts also are in the Oberlin Heritage Center’s collection. The Stetson quilt had been on long-term loan to OHC from the Allen Memorial Art Museum for many years, and was donated outright to the Heritage Center in 2006. 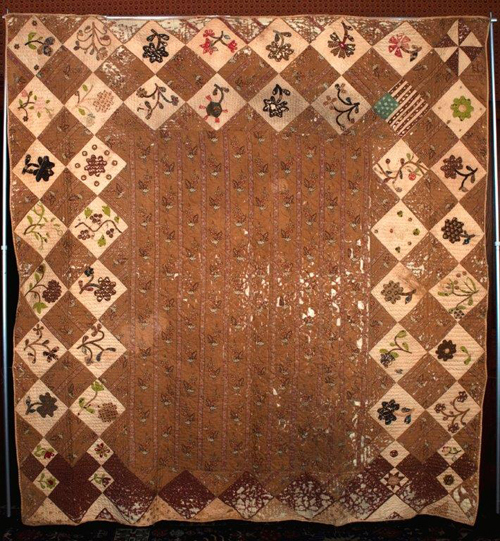 The date from AMAM for the quilt was 1831, and genealogical research suggests that it was probably made in what is now North Ridgeville, Ohio as that is where Stetson’s family was at that time and where he grew up. The quilt was obviously used, and used some more, patched, repaired and used again. One can see where Stetson sat down on the bed every night to remove his shoes and socks, and put his hand down to push himself back up next morning when he put them on again. At present, the polished cotton of the main fabric is extremely fragile and it is impossible to fold and move the quilt without risking losses. Cost estimates range from $3,000-$6,000 for conserving the quilt so that it may be handled and exhibited without fear of causing damage. Prue’s fondness for the quilt is evident as she explains: "The design of the quilt is absolutely unique, and the joy this woman had creating the pieced and appliquéd blocks is obvious. It deserves to be able to be displayed, enjoyed, and provide inspiration for years to come." Your gift of any size will help fulfill Prue’s retirement wish. Thank you! A donation form can be downloaded from the attachment below.